Oh, ye of hairy little Hobbit feet, rejoice! This is one of the most unusual of the posthumous outpourings of the Tolkien Trust, the literary materials of J. R. R. Tolkien (1892-1973) so scrupulously managed by his son and literary executor, Christopher Tolkien (b. 1924). 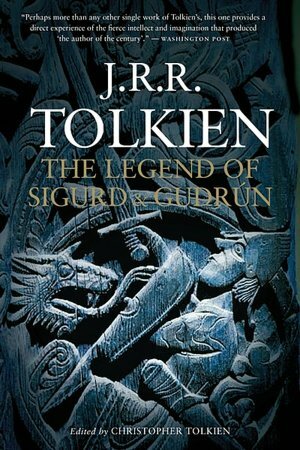 Where other posthumous Tolkien publications supply extra Middle Earth material, “The Legend of Sigurd and Gudrún” is Tolkien’s own adaptation of the fragmented sagas of the Völsungs and Niflungs (or Nibelungs) found in the Codex Regius and the Elder and Poetic Eddas. Tolkien never did anything without a reason. His purported reason for writing Lord of the Rings was to create a native British mythology to replace the one that was lost during the many invasions of Britain. In this book, his motive was to “unify and organize” the divergent and contradictory versions of the sagas presented in ancient manuscripts. Here the reader – to his or her swooning delight – will get to experience J. R. R. Tolkien as the Professor of Old Northern Languages (including Anglo-Saxon, Old Norse, Old Icelandic, and Old English), the job he held from 1926 to 1939 at Oxford. Tolkien only mentioned these poems a couple of times in his private letters, but apparently his lecture notes and these poems were misplaced amidst the Middle Earth paper storm. The notes and manuscripts that finally surfaced are undated; Christopher intuits the material was written in the early 1930s. Tolkien’s poems are wonderful reading, as he mastered the style of the originals while managing to conflate and repair the confounding contradictions in the Eddas, sagas and Niebelunglied in a way that makes sense (I’ve read translations of the originals, and there are spots and gaps that leave the reader floundering). But WAIT! The treats don’t stop there! The lengthy Introduction includes transcripts of J. R. R.’s lecture notes on the Elder Edda, Norse poetry and verse forms, along with remarks about the early Icelandic transcriptionists and bards, Snorri Sturleson and Saemund the Wise. Following each Lay, there are Commentaries that include remarks from both J. R. R. and Christopher. Christopher outlines how his father sifted through the extant legends and gives the reasoning as to why certain details are included, omitted, or plot sequences so arranged. There are also references to word etymologies that provided name sources for the Middle Earth creatures (like wargs, Ents, etc.). If there’s an Appendix in a Tolkien book, you just know it has to be good. This volume has three. Appendix A—A Short Account of the Origins of the Legend gives some historic background into the Burgundians (Niflungs), Atilla and the Huns, and describes how some of this material appears in Beowulf. Appendix B—“The Prophecy of the Sibyl” is another original Tolkien poem inspired by the Völuspá in the Edda Saemundar. Appendix C is “Fragments of a Heroic Poem of Attila in Old English.” This is actually a poem written by Tolkien in Old English (with a translation). It corresponds to the first few lines in Atlakviða (an Old Norse poem about the clash between the Niflungs and Atli, aka Atilla) with additional notes about words, story line, and place names. This volume is as close as a person can get to attending a Tolkien lecture these days. I highly recommend this book as a total Tolkien geek’s delight, providing the geek is interested in ancient Norse legends, old northern languages, the retelling of sagas that are garbled in surviving manuscripts, and the discovery of a (nearly) lost work of Tolkien’s that directly relates to his love of ancient lore and his many years as a professor of old languages. In addition, the Lay of Sigurd and Gudrún shows the powerful ties between ancient Northern sagas and Tolkien’s Middle Earth, the characters and drive of his heroes, the powerful roles women play in multi-generational dramas, and various ancient plot devices, like rings and dragons. These sagas were Tolkien’s original sources for the epic sense of story and history, tragedy and triumph that are woven into the Lord of the Rings trilogy and The Silmarillion. In other words - marvelous!